Westchester Magazine’s Wine & Food Festival, taking place on Saturday, June 9, is shaping up to be bigger and better than ever before. With more celebrity chefs, world-class wines and over 50 top restaurants, the festival will be sure to please every palate. Westchester Magazine is excited to welcome NBC TODAY Food Contributor and cookbook author Siri Daly to the NewYork-Presbyterian chef demonstration tent at Kensico Dam Plaza to do a live cooking demonstration and sign her new cookbook, Siriously Delicious. 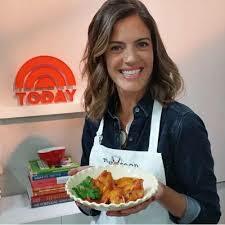 Daly, who often cooks on-air with her husband Carson Daly, will demonstrate a recipe from her new, debut cookbook. A meet-and-greet book signing will immediately follow, and copies of Siriously Delicious will be available for purchase. “I’m thrilled to be participating in Westchester Magazine’s Wine & Food Festival this year as part of the culinary community and to benefit the various charities that take part,” said Daly. The signature event of the Wine & Food Festival, the Grand Tasting Village, takes place Saturday, June 9, from noon to 5:00 p.m. at Kensico Dam Plaza in Valhalla. It features tastings from 50 + local restaurants and more than 200 wines & spirits. Experience Grand Tasting Village as a true sommelier by purchasing a ticket to the exclusive Connoisseur Tent, which features rare, high-end wine and food, and reserved seating at the chef demos (first come, first serve). The 2018 Wine & Food Festival, which draws more than 6,500 people from across the New York Metro area including New York City, Westchester County, Long Island, New Jersey and Connecticut, will feature 100+ top restaurants and a selection of world-class wines. Visit www.westchestermagazine.com/winefood for complete details, participating restaurants, chefs and ticket sales. This entry was posted in Lifestyle, Westchester. Bookmark the permalink.